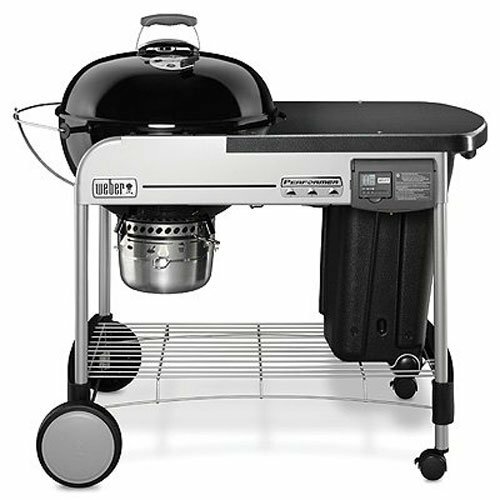 While there are many great charcoal grills available, if we had to choose one it would be the Weber 15501001 Performer Deluxe. We love this grill because its light weight which means most people will have no trouble pushing it out of the way when not in use. A charcoal grill gives you the chance cook delicious food with plenty of smoky flavor. 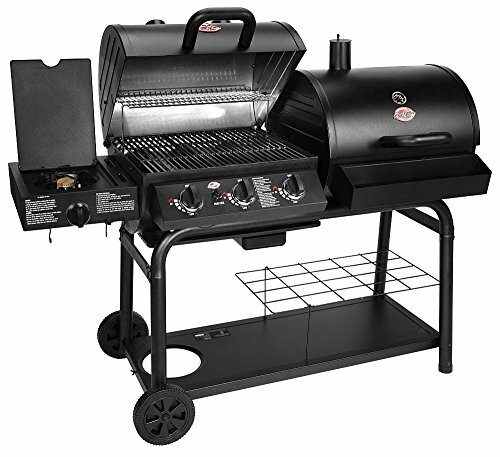 In this buying guide we will look at various models in our charcoal grill reviews and discuss in more detail about individual features you should be aware of before making a purchase. Why Buy A Charcoal Grill? What Makes Be﻿st Charcoal Grill? If starting the fire is a challenge or a hazard for you, the Weber 15501001 can help! The gas ignition makes starting the fire a snap. This charcoal grill features a built-in briquette storage bin, easy to clean ash catcher and plenty of preparation space. The 22 inch diameter grill bowl is easy to clean and ceramic coated to prevent rust. Once your grill cools down, ashes can be easily accessed without having to remove the grate thanks to the aluminum ash catcher. The 2 part grate system makes cooking adjustments and clean-up easy! Easy To Light: The gas powered ignition system will make your grill easy to start so you can spend time with your guests! Prep Space: The preparation table on this unit is as big as the grill. Portability: Both ends of this grill have wheels, so one person can move it easily. Caster Choice: The large casters under the grill bowl are sturdy enough, but the small casters under the charcoal bin may not hold up when the storage bin is full. Gas Bottle Starters: Disposable gas starters can be costly and run out at inconvenient times. Ash Can Is Awkward: Because the ash can is hinged, some find it hard to empty all the way. The Char-Griller 5050 is an excellent cooking tool for dedicated grillers. Not only can you prepare smoky steaks with plenty of real charcoal flavor, but the gas side allows you to grill lighter fare such as chicken, vegetables and fish over a clean gas fire. The 5050 also has a side burner for sauces or other dishes that need a controlled flame. The 5050 Duo Grill is sturdily built and offers porcelain coated cooking grates to reduce the risk of rust. 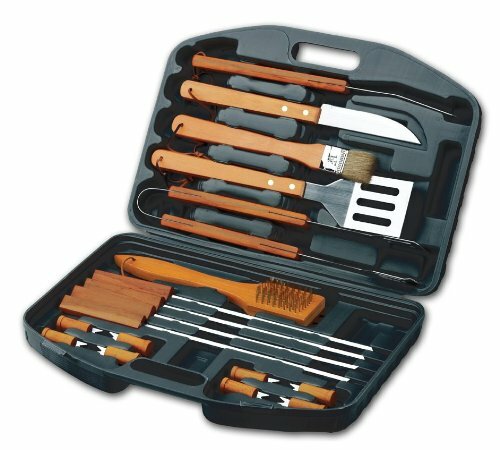 Clean-up will be easy thanks to all the built-in storage for your grilling tools. Additionally hooks are included so you can hang utensils for easy access. Real Estate: This grill offers over 1,000 square inches of grilling space. Flexibility: While charcoal flavor is a great addition to red meats and hearty vegetables, many foods are completely overpowered when prepared on a charcoal grill. The gas option opens up your grilling repertoire! Warming Racks: Timing can be tricky when cooking over open flames, so the 5050 offers you three tiers of warming racks. Space: From burner to charcoal, the 5050 Duo is 5 feet long. Those will small patios may find this tool hard to maneuver around. Weight: This grill weighs in a 144 pounds. While it does have wheels so you can lift it and reposition it, moving it will be a challenge for some. Side table: While the Char-Griller has a burner cover, there's no side table to set your transfer pan on when moving foods from grill to table top. Serious charcoal grilling fans will love the CB940X. This hearty tank of a grill is built for fire. 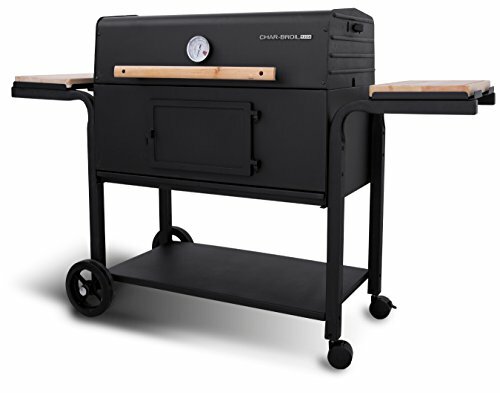 The CB940X features a front charcoal bed access door to keep things hot while you tend your briquettes or wood charcoal, and gives you two convenient side tables for transferring food from grill to table. Warming racks are included and the fire pan height is adjustable. The porcelain-coated cooking grate will give you plenty of space and provide rust resistance for years to come. Prep Space: Moving food from house to fire or fire to plate often requires a spot to set things down, and the CB940X offers two. Charcoal Access: Lifting the grill lid to tend the fire lets the heat out and adds time to your cooking process. The front door holds the heat. Removable Ash Pan: Clean-up is easy and you can be ready to grill again in no time! Weight: This grill tops out at nearly 190 pounds. Wheels: One set of wheels is large and plastic, the other set is small and plastic. The small wheels can't handle the weight of the grill. Assembly: This grill is built of hearty steel, and the assembly can be tricky. Get some strong help. The K﻿﻿a﻿﻿mado 16620 is a terrific option if you're grilling for small households or if you enjoy smoking as well as grilling. The exterior is powder coated steel, the interior is porcelain coated steel. This unit will hold the heat! The Kamado 16620 offers two prep tables and multiple hooks for hanging your grilling utensils. Between the cooking surface of 314 square inches and the warming rack with 133 square inches, you've got plenty of space in which to prepare your favorite foods over hearty hardwood charcoal. 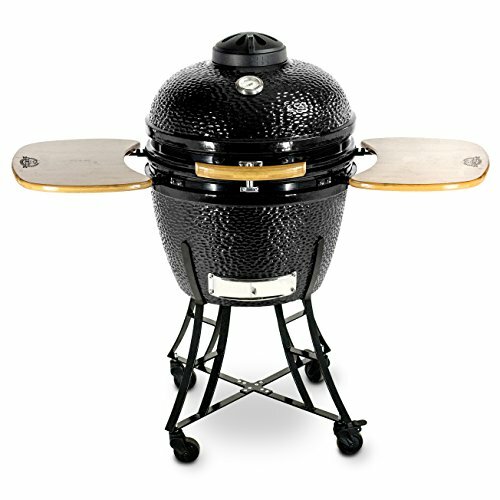 Portability: The Kamado 16620 is small enough to move into storage easily once it's cooled. Heat Gauge: These units heat up quickly but cool slowly, so the heat gauge can help you monitor your cooking temp even though you can't see the fire. Flexibility: The construction of Kamado cookers makes it possible to cook many non-traditional grilled foods including pizza. Size: These units are efficient but small; you may need more than one if you like to both smoke and grill at the same time. Rust: This is not a ceramic cooker; any scratches or dings in the coating may lead to corrosion. Lid: The hardware holding the lid in place cannot seem to handle the weight of the lid; open with care during your first few cooking sessions so you can be sure it will hold! 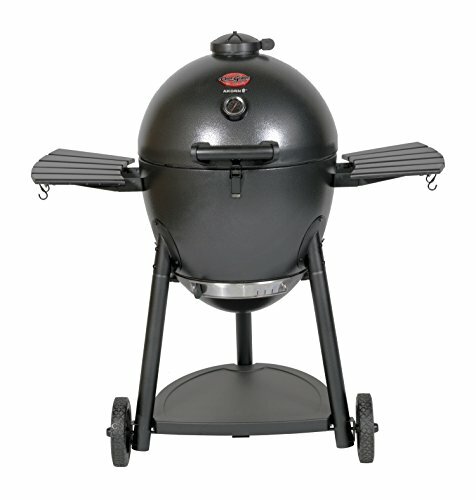 If a ceramic cooker appeals to you, the Pit Boss 71220 will be a great addition to your barbecue arsenal. This cooker gives you plenty of heat and cooking space in a small package. The two-tiered stainless steel cooking grates allow you to stack food, and the top one flips up for easy access to larger pieces such as steaks or chops. Ceramic cookers heat up quickly and cool down slowly. The Pit Boss 71220 offers quicker cooling options thanks to the cast iron damper at the top of the cooker, right next to the temperature sensor. Nest: The Pit Boss 71220 sits in a metal nest with four casters, two of which lock to keep it in place. Prep Space: The two folding side shelves give you plenty of prep space when you need it and fold away when you don't. Ash Tray: Once your egg is cool, the ashes are easy to get to and a tool is included to help. Thermometer: The thermometer is not especially accurate; always use a quality ﻿﻿meat thermometer to confirm food-safe temperatures. Weight: The Pit Boss 71220 is nearly 200 pounds. Make sure you have safety placed your grill before starting the fire. Side Table Assembly: Some users may experience problems mounting the side table brackets. Be sure to test the tables with a little pressure before placing any food on them. It should be pointed out that gas grills are easier to light than charcoal, and their grilling layout makes it much easier to cook over consistent heat. A well-maintained gas unit is a lot like having your own oven in the backyard. However, gas grills impart about as much flavor as your oven to the foods you prepare; that is, none at all. Additionally, gas grills are prone to rust over time, resulting in a failed burner plate which must be replaced. Additionally, many gas units feature temperature sensors easily visible on the front of the unit. This sensor is not always available on charcoal grills. If you like to cook over an open fire and love the smoky flavor of charcoal-grilled foods, charcoal grills are a great investment. Be aware that they take some practice and some tending. Charcoal grilling is quite efficient if you use the right tools and maintain them properly. A smaller unit with a deep bowl is easier to light and manage, but you'll need to work close to the fire to tend your food. The line between charring and incinerating can be fine. Investing in quality grilling tools is critical. Quality grilling mitts and long-handled cooking tools will protect your skin and eyes from heat and smoke damage. These tools can help make it easier to monitor your food more closely, to achieve the perfect level of char.​ Of course safety is the biggest concern. Newspaper and perhaps a touch of lighter fluid. From the bottom up, there are several features that can make your charcoal grilling easy, fun and safe. You need to be able to move your grill; where you store it may not be an ideal place to cook, and if the wind switches, you don't want to be penned in a corner and smoke blind. Before you fire up the grill, move it out away from your home and belongings, and give yourself space to maneuver around it. Make sure the path from food prep to grilling unit is clear. Not every unit will come with extendable legs or an adjustable platform, but these features will make your cooking experience much more comfortable. They will also protect you from having to lean over a hot fire. Flare-ups, caused by dripping fat, can be dangerous. While an ash drawer can be nice and save you some cleanout time, it's important not to rely too heavily on this feature. A build-up of ashes will limit oxygen flow and may make it hard to keep your fire lit. Use the ash drawer as a repository until everything cools down, then dump it. A round-bottomed charcoal pan is easier to light than a flat pan, as the charcoal will be clustered in the bottom of the pan and easier to light. It's important not to buy too big a unit for your regular cooking needs. While a huge grate can make it easier to arrange a ﻿﻿large barbecue party in your yard, grilling for two on a huge charcoal grate can be frustrating and require you to burn through a lot of briquettes. You want a steel grate that fits snugly into the bowl or box of your unit so you don't lose food over the edge. The question of how to clean a charcoal grill is fairly straightforward; you clean it after grilling so you can reduce your risk of rust. Scrub away stuck-on food particles with a wire brush while the unit is still warm. Many backyard chefs also recommend cleaning the grate before you cook by scrubbing it down with a wire brush once it's good and hot. To truly prevent rust, you'll want to clean it after you cook, then scrub it down again before the next cooking session. Rust is always a risk, even with a great cover, because moisture from the air condenses on the steel even when you're not using the grill. Lids offer a great way to capture the warmth of the unit and cook thicker cuts of meat. However, you should always use a digital thermometer to make sure the meat you're cooking has gotten hot enough all the way through. If the idea of lingering over a hot stove on a hot day in an overheated house doesn't appeal to you, investing in a charcoal grill may be a great idea. What Makes Best Charcoal Grill? The best choice is really the one that works best for your household. If there are only a few of you, a huge grate is a lot of real estate to heat and monitor. Additionally, if you use your BBQ only on special occasions, you may be able to get by with a smaller one, such as a H﻿ibac﻿﻿﻿hi. Another option is to invest in a good camping or portable grill. These units make it possible to fold up your unit once it's cool and store it out of the weather, reducing the risk of rust and reducing clutter on your patio. If you've got plenty of people to cook for, the sky's the limit. There are large folding and table top grills with plenty of storage flexibility and grilling space.